Nothing beats a bowl of creamy homemade guacamole when you’re feeling snack-ish. This guacamole recipe from the new FIXATE Vol. 2 Cookbook is bursting with bright flavors like tomatoes, onions, fresh lime juice, and cilantro. It’s the perfect side dish for the big game or any time you’re craving avocado. Serve it with homemade pretzel chips and you’ve got a winning combination on your hands. Pro tip: You can get more delicious recipes like this in the FIXATE Vol. 2 Cookbook, which comes with Ultimate Portion Fix. Learn more here. 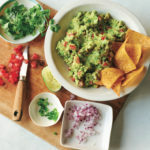 This guacamole recipe is simple and bursting with bright flavors like tomatoes, onions, fresh lime juice, and cilantro.